Healthy eating (and living) seems to be the craze these days. There seems to be so many celebrities who are vegetarians or even vegans. The longest period that I have tried not to eat meat or seafood was a month. Now, I do not think that I will be a full-on vegetarian any time soon, but with healthy living in mind, I had been trying quite a number of vegetarian restaurants lately. If there is a vegetarian restaurant that I will introduce to my carnivorous friends, it would be Whole Earth. 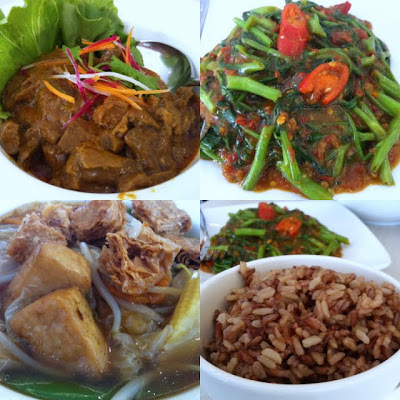 The restaurant serves tasty "Peranakan" and Thai food, and sometimes, you would be wondering "you mean this is vegetarian?". Happy to report that the dishes that had none those "mock meat" that is so typical of local Singapore vegetarian food. They use good quality mushrooms, tofu, vegetables and natural spices. The dishes were tasty and flavourful. Who says healthy food can't be good? Had been to the restaurant twice, and I am pretty sure I will be going more often. So, when you feel like having healthy wholesome food, remember to pay a visit to Whole Earth.